Gibson has taken a bold technological step with the introduction of their Les Paul and SG robot guitars. While they may not be for everybody, these two models get high marks for both innovation and functionality. Plus, they’re really cool. 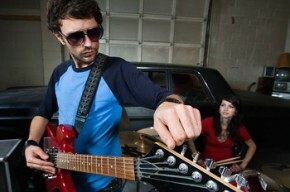 Gigging musicians will love the creative tuning feature the Robot Les Paul and SG bring to the table. Let’s say you’re on a dark stage, getting ready to play. You discover your guitar’s way out of tune. Do you signal frantically for your front man (or woman) to chat up the audience while you tune up? Or do you try to quickly switch guitars, and give up your main axe until the next set? With a Gibson Robot guitar, the answer is “neither”. You simply pull out on the master control knob. It’s located in the same spot as on a regular Les Paul or SG body. Strum the open strings once, and then watch in amazement. Imagine ghostly hands adjusting your tuning pegs all at once. The process takes less than 5 seconds. 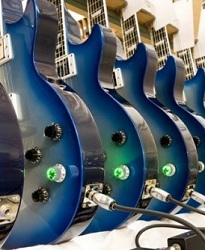 Then, a blue LED blinks on your master control knob indicating your guitar’s back in tune. Push the knob back in, and you’re ready to rock. That’s only the beginning. Let’s say you use standard tuning for most of your songs. On a few, you need to switch to drop D. Then a couple of others are open E. Does that mean you need three guitars? Or are you going to frantically re-tune every time? The Robot guitars have that figured out, too. On that same master control knob, there are 6 of the most common alternate tuning presets. Just select the one you want, and then strum the open strings again. Say goodbye to that tuner on your pedal board–or in your rack. Break a string? Forget about fumbling with a manual string winder. Start by pulling out the tuner head knob, and feeding the string through the post as you would normally. The post screws down by hand, locking the string in place. Push the tuner head knob back in, and then select the string-up mode on the master control knob. The new string is back up to tension in seconds. You’re ready to tune as you like. The Robot technology also makes intonating your Les Paul or SG a breeze. In the intonation mode, LEDs on the master control knob tell you exactly how to adjust the bridge screws. If they glow green, you turn the screw clockwise. Glowing red means you turn it counter-clockwise. Each light flashing indicates the number of half-turns you need to make. For as long as the guitar has existed, guitar lovers have had two choices—live with a temperamental and out-of-tune instrument or make frequent trips to the shop for setups. Not anymore, the Gibson Robot is virtually fool-proof. 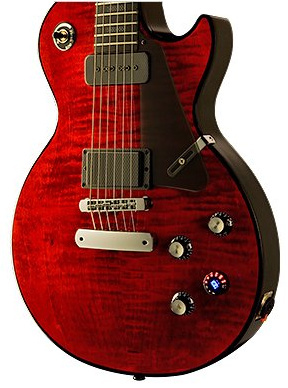 Find hot buys for Limited Editions Gibson Robot Guitars at Musiciansfriend.com. Don’t forget to visit Gibson’s official website to see their most up-to-date gear. 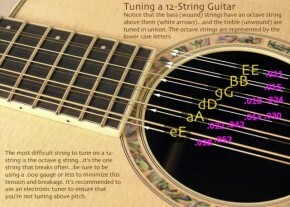 How to Tune a 12-string Guitar and what Gauge Strings?